Colour without commitment? Spray then sleigh! Looking for party hair with wow factor, but don’t want to commit to colour? We test the instant shade solutions – but do they do what they say on the tin… or tube… or can…? When you’ve found a great colour, which suits both you and your lifestyle, it can be hard to step away from. When party season descends though, it’s a great time to let your hair down (pardon the pun) and step out of your comfort zone to try a new style. While the prospect of pastel or neon semi-permanent shades may not suit your routine, salons also offer some great temporary alternatives, with great take-home products that can be applied from the comfort of your own bathroom. 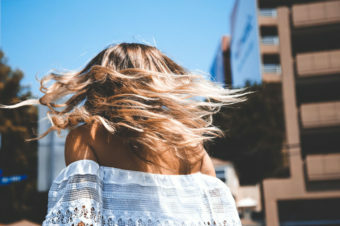 “As somebody who has switched between varying shades of blonde and brunette since my mid-teens, when it comes to colour I’ve always played it safe – and for the most part I’ve been happy with the end result. While it’s fair to say I’ve always been a little scared of opening up my colour horizons, the option of adding a vintage-blush hue without weeks of upkeep was pretty tempting, and I was excited to step out of my comfort zone. 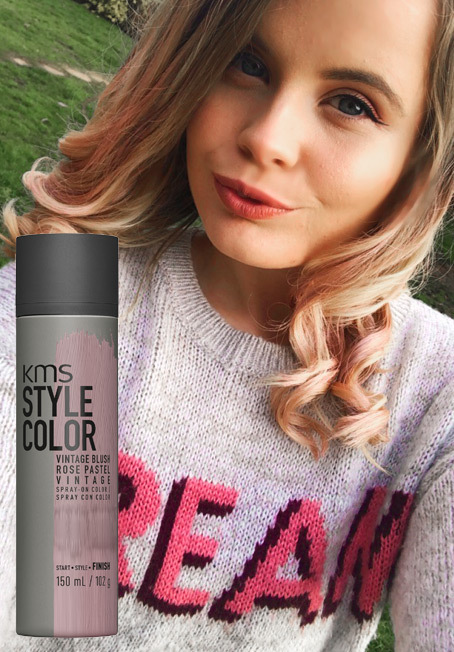 “When applying KMS STYLECOLOR, I must confess I had a helping hand from a mate, which I would definitely recommend (if possible) to help achieve an even coverage. 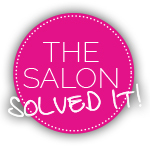 It’s also worth pointing out that we used the spray outside, and my ever so helpful hair accomplice sprayed away from the hair to prevent any ‘dot’ marks at the end of application. “To safely avoid any Tin Man hands, I’d also suggest wearing gloves but on the whole, it was easy to use and a quick way of upping the ante of my desired colour. I opted for adding touches of pink through my mid-lengths to ends, which worked well with my balayage and looked great when sprayed over freshly curled locks. 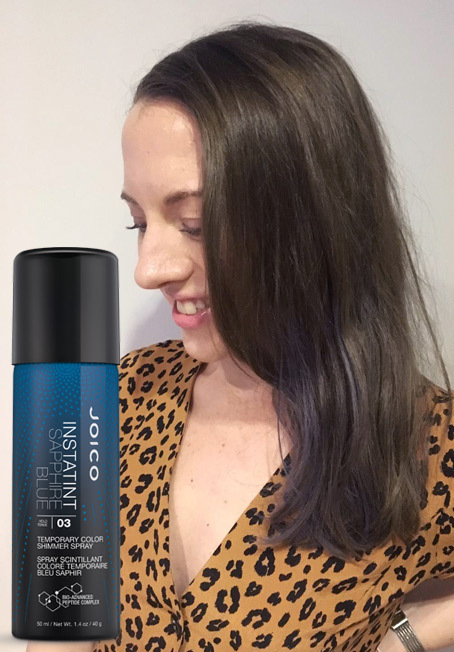 “I figured I would have the easiest job of the lot – a dinky can of aerosol (JOICO’s InstaTint in Sapphire Blue) to give me iridescent, periwinkle blue hair. What’s not to love? The biggest problem was being the only brunette of the three, which drastically reduced my options. The orange and pink had the least chance of showing up against my hair – and besides, I always dreamed of having a cobalt streak in my hair during my teen pop-punk years. “I was aiming more for subtle streaks through the ends rather than a bold block of blue. I selected piece-y strands, starting from underneath, and held them out to spray. I started out too far back and brought the can closer, working in back-and-forth motions to get good saturation. The main problem was that the scent was so overwhelming I almost immediately had to stop and take a break. 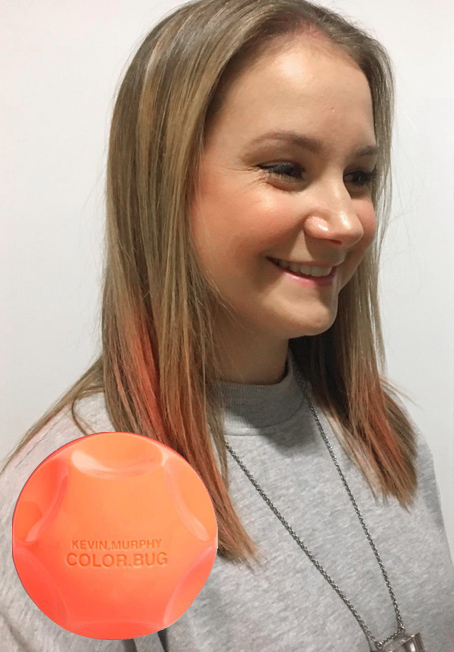 “The Color Bug from Kevin Murphy is a curious little product. Essentially a hair chalk in an ergonomically-styled holder (that looks remarkably like a dial that’s fallen off the front of a kitchen appliance), its designed to eliminate some of the mess caused by rubbing a chalk block on your strands. The packaging is pretty easy to grip and does protect the contents from snapping or smashing, but would the results mimic the neon glow of the plastic grip? “Just like a regular hair chalk, you’re meant to section your hair and rub the hair shadow along the lengths to transfer coloured powder to your strands. This is relatively easy to do, but as the product sits slightly recessed in its holder, you do have to push your hair into the shadow ‘pad’ to make it work. This means that the hand you place behind your hair to do so inevitably ends of covered in coloured powder too.